We spent a great week enjoying the good company of family and the surf culture of Manly in Sydney as we planned the final assault on Brisbane. As luck would have it the Hurley Australian Open Surf and Skate Carnival was being played out only metres from where we were staying. We were treated to a continuous procession of boards, bikinis and bleached blonde hair as well as awesome displays of skateboarding and surfing with a concert or two thrown in. 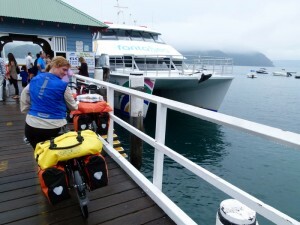 Most of you know by now that we are no fans of riding on busy roads with little or no infrastructure for cycling so when we discovered a series of ferries on coastal roads that would get us off the Pacific Highway. We started to plan a much quieter option to finish the trip. 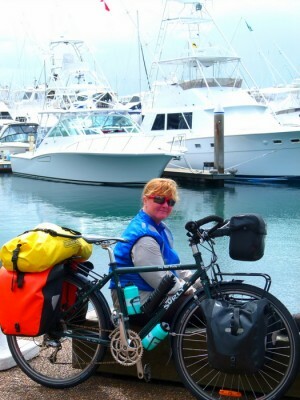 It would involve a series of ferries crossing various inlets, bays and rivers that would reduce the distance we’d ride a little but decrease our stress levels enormously. All too soon it was time to leave. The weather predictions were a bit dire and we certainly weren’t going to be getting any help from the wind but we could almost feel our riding muscles getting rusty after enjoying a week of too much hospitality. Memories of our grind up Lavers Hill after almost three weeks off the bikes at Christmas time were still fresh and I wasn’t relishing the thought of repeating the performance. We were hoping to make The Entrance on the first day. It was only 65km away but we had no real idea of the terrain. 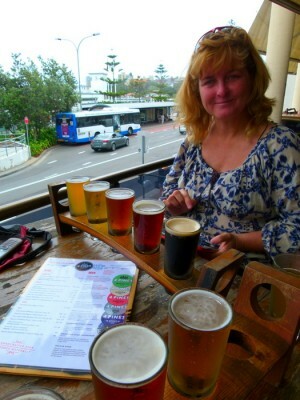 Terrigal was our fall back plan. We headed off up the Manly bike path, slowly weaving our way through the local inhabitants out for their dose of exercise. Some obviously had a clear purpose, pounding the pavement with determination, while others seemed to be making a sport of trying to frustrate cyclists ( AKA US!) by wandering aimlessly all over the path. We picked up Pittwater Road which had a good bike lane and headed through to Narrabeen. Up until then we’d only experienced a slight drizzle and definitely not enough to hamper our progress. But…. as we passed through the main shopping district the heavens opened up and it ABSOLUTELY poured. There was nothing else to do but find a coffee shop, a very easy task in this neck of the woods. As we gulped down our last mouthful, it eased up enough for us to think we were in the clear. That thought lasted all of about 500m as it began to teem down again. We took shelter under a bus shed and hunkered down to wait. We finally headed off again about 45 minutes later. Our route took us onto north onto Barrenjoey Road, up several healthy hills and onto Palm Cove to catch the ferry to Ettalong. Barrenjoey Road is a little dangerous to ride on in busy traffic. There’s no shoulder in quite a few places and the wet road made the descents just that little bit more tricky. There are some lovely views over Newport with the luxury houses and yachts but I was a bit too busy watching the road and traffic to really enjoy them. The ferry to Ettalong takes around 45 minutes and costs around $11. It would be an absolutely stunning journey in sunshine and even in the gloom was quite beautiful. For those who care, the journey takes you through the area where Home and Away is filmed. We figure it probably chopped about 50km and quite a few big hills off our journey. Add to that a significant reduction in traffic induced agitation and it was well worth the money. We picked up the road to Terrigal. The shoulder is fairly good for much of the way but does inexplicably become sparse in several places. Once past Terrigal, the road flattens out all the way into The Entrance. With the weather still threatening downpours we grabbed a cabin at the Two Shores Caravan Park, north of town. It was totally out of our budget at $110, but then totally worth it in the current conditions. The worst of the weather was meant to clear by mid morning the next day so we had a late start into Newcastle around 60km away. We spotted “Bicycle Event” signs not far out of town and were soon joined (and quickly passed) by the front runners in the Gosford to Newcastle challenge. The route up is on the main highway but riding conditions were excellent. Good surface, wide shoulder and reasonable gradients had us whizzing along and the signage seemed to be making motorists much more aware of bikes. As the heavens opened once again we stopped in Swansea to find out a little more information about getting into Newcastle. As luck would have it the lady informed us of a dedicated bike route that began at Belmont, just another 10km down the road. The Fernleigh Track was awesome. It winds its way through some gorgeous rainforest, has an extremely good surface and modest gradient but best of all we were off the highway and away from the whizzing traffic. We got absolutely drenched again but the shock value of that was well and truly over. The track pops out at the Adamstown train station. It was a simple matter then to head straight down Glebe Road and weave in behind the South’s Football club until we found the Burwood Pub where we had booked a room for the night. No sooner had we pulled in and it started to rain sideways. Glad we had a room for the night? You betcha. We were meeting up with friends from Brissie and we were much happier to have a beer in the bar downstairs than huddle in a camp kitchen somewhere on the outskirts of town. The next day, in much better weather, we had another short ferry ride that cut several kms off the journey and took us out of the traffic for a while once again. The ferry from Newcastle to Stockton costs a mere $2.60 but means you avoid a very busy bridge in the industrial area. A bike path from the ferry stop leads you around the river to the main Nelson Bay road where you basically follow your nose for 60km. We did take a nice quiet detour for around 11kms on Marsh Road that got us out of the traffic for a while without adding too much to the overall distance. The road is flat and fast on the whole but the shoulder does disappear in places. 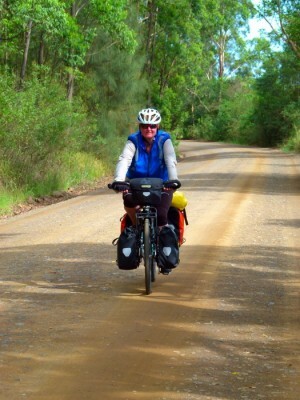 Bike paths start to appear a few kms outside Nelson Bay itself but can be a little rough in places. We were staying with relatives for the night and had to amuse ourselves for the afternoon until they finished work. The Marina area was gorgeous as the sun reappeared. We took a wander about to enjoy the sights and checked out the ferry to Tea Gardens the next day. Lucky we did as maintenance on the pier had reduced the service to 1 per day (that was big enough to take the bikes) at 11.30am but the prices of refreshments sent us back into town for a beer and a bite. We had a lovely evening with family and woke refreshed for the next leg of the journey. Rather than head out to the highway we were taking the ferry to Tea Gardens ($12 including bikes) and then heading up through Myall Lakes National Park to Buladelah approximately 50km away. 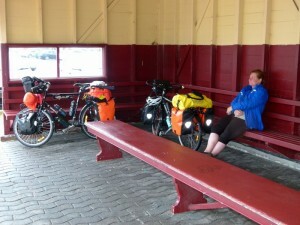 The only downside for this first ferry was having to totally unload the bikes so they could put them on the roof. I’m not sure if this was only because the ferry was pretty full as there was only one, OR, if this is standard practice. The ferry takes around an hour but it was more like 90 minutes before we had everything off the ferry and back on the bikes. The route took us over the bridge to Hawks Nest where you pick up a very flat, quiet road all the way to the Bomba River Ferry. There are lots of campgrounds along the way nestled in picturesque areas of the National Park. The ferry across the river is free and takes about 2 minutes to cross. Just make sure it’s operational before you head this way as it was shutting down for 2 days maintenance the next day. 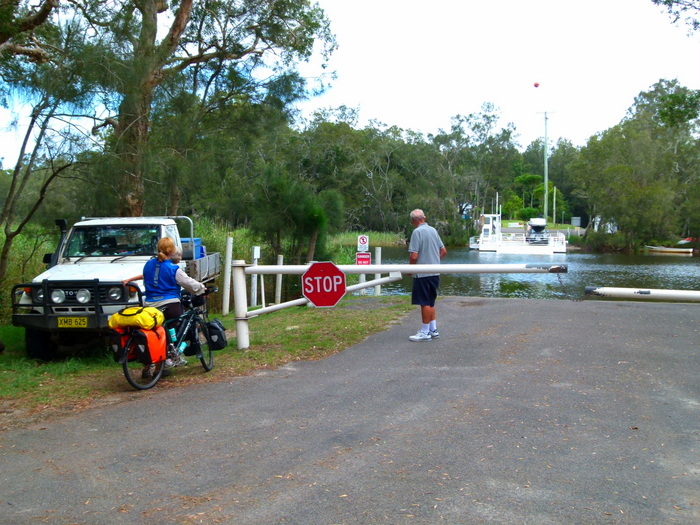 The ferry delivers you to the gate of the Myall Lakes Holiday Park which looked really nice. One for a return trip I think. It had a nice little bar and restaurant where we had a break before heading off on 10km of good gravel road towards Buladelah. Once again it’s quite flat and very quiet. I probably wouldn’t attempt it in torrential rain but even after the significant downpours we’d had the previous few days, the surface was pretty compact although we did shake, rattle and roll over the ruts made by the water. Buladelah is a quiet little place that has been bypassed by the new highway. We pulled up at the Mount View Hotel where $69 gets you a pretty reasonable room with all the mod cons. There is a campground in town near the pub that seemed pretty popular with campervans but we hadn’t seen that before we booked in. 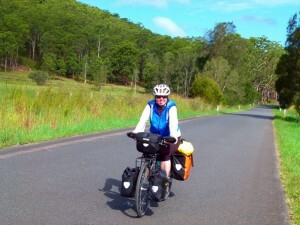 It was a bit longer ride the next day to Taree (75km) and we started to get back into the hills. Unfortunately Sakura decided she didn’t like gearing down into the granny gear so a couple of the very looooong ups were a bit of a grind. At about 6500 km, things were starting to show some wear including my chain which was getting decidedly sloppy and my brake pads were nothing short of shameful, requiring quite of bit of pressure to bring the bike to a halt. The first thing we saw as we entered town was a bike shop. The boys did the best they could with my gearing and replaced both back and front brake pads. All for the grand price of $35. We headed up to the Riverview Motel where a studio room set us back $75. Another good decision as thunder, lightning and torrential rain rounded out the day. Taree to Port Macquarie is a pretty easy ride. It’s almost 80km but pretty damn flat and we had a tail wind for much of the way. It was hot and humid so water began to become a bit of a hassle. We had started to take water stops and refills for granted since we hit the East Coast but some of the distances between service stations and towns can leave you a bit short if you have to drink a lot. As the rain clouds closed in we turned off to Kew. Great timing once again. As the rain came down in earnest we investigated the range of maps in the shelter of the Tourist Information. We pulled into the servo up the road and had a coffee and bite to eat by which time the weather had cleared a bit. As we pulled into a very cheap motel on the main road, the heavens opened up again. We sure hoped the farmers were getting some of it because it was sure as hell making this bike ride interesting! We’ve been to Port Macquarie before and it’s a great place to be. The beach is good and there are plenty of activities to keep you occupied especially on the water. 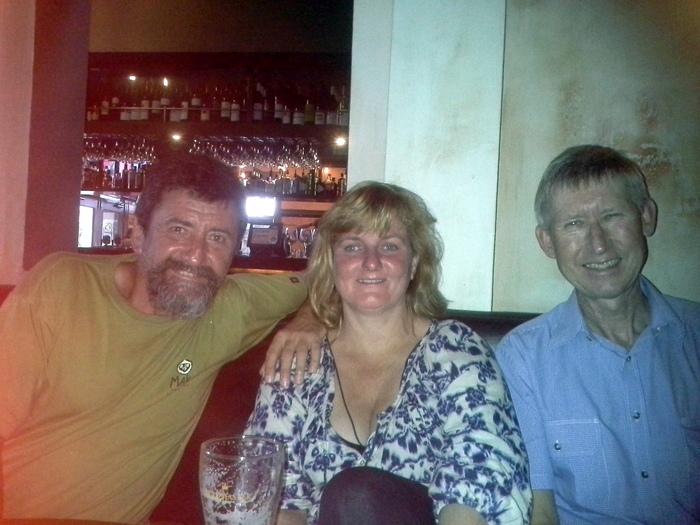 Our main focus, however, was catching up with two lots of mates we hadn’t seen in years. That subsequently meant another days rest because we celebrated meeting up again rather a bit too hard with both of them. Still a day off would do the legs good. It had been 6 days of riding so we’d earned a bit of a rest before we headed north once again where we knew we’d be hitting at least a few hills again on the way to Queensland.